A beautiful lawn and yard makes every Twin Cities home more beautiful and adds measurably to its value. For homeowners and tenants alike, an attractive yard is an asset that adds to quality of life and enjoyment of outdoor living. Creating and maintaining a healthy, attractive lawn, garden, and landscaping features, though, can mean a lot of work for property owners. Some of that work is heavy labor or requires expensive equipment, so yard and garden maintenance is often neglected. For busy homeowners and property managers, finding the time and energy needed to handle the task of keeping lawns and landscaping features looking great is always a challenge. That’s why lawn, garden, and landscaping jobs are some of the most popular services that customers request at our Minnesota home service company. Our network of lawn care and landscaping specialists covers the entire Minneapolis St. Paul metro area, bringing expert, efficient crews to your property to keep your yard looking terrific at affordable prices. The cost of these services is more than offset by the improved appearance of your home and by saving your valuable time for other activities. It also eliminates the need to own expensive lawn and garden equipment. The lawn care pros at our full-service Twin Cities handyman company have the professional equipment, knowledge and experience needed to handle every lawn care job. From creating a brand new lawn to complete maintenance of your existing lawn, one call to us is the first step to a beautiful, luxurious lawn that enhances your home. New Lawn Creation – For any property, a fresh new sod lawn is one of the best ways to get started. From new lawns for brand new homes to complete replacements of existing lawns, count on us for proper preparation and sodding. Lawn Mowing & Trimming – From one-time services to regularly scheduled lawn mowing, you can count on the lawn care professionals from our residential handyman service company for mowing, edging, and trimming services. Aeration, De-Thatching & More – Keeping your lawn healthy, luxurious and green means properly caring for the soil. Using professional equipment and skilled operators, we make short work of major lawn maintenance chores. 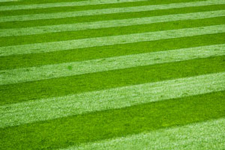 Weed Control & Fertilizing – Every spring and fall, your lawn needs weed control and fertilizing treatments. We have the right products and right equipment to handle these jobs expertly, at an affordable price. Leaf Removal – The beautiful trees in your Minneapolis St. Paul yard become leaf litter factories each fall. Eliminate raking and bagging chores by hiring our crews to vacuum up and mulch those leaves. The cost is lower than you’d expect. Garden Beds – From professional roto-tilling, mulching, and soil preparation, count on our landscaping experts to create, renew, and maintain your garden beds for annual plantings or perennial borders. Retaining Walls – A multi-level yard offers wonderful potential for beautiful landscaping features. We can build, replace, and maintain retaining walls and raised garden beds, using a wide range of materials. Landscaping Features – From water features and fire rings to lawn and garden edging treatments and walkways, our landscaping team can make your vision come to life. We can also suggest affordable new features to enhance your yard. Plantings – Let our landscaping pros help you with plant and tree selection and complete planting services. 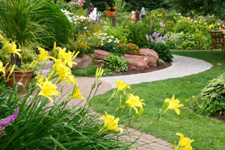 Our experience and knowledge is on call to create beautiful plantings to grace your property. Trimming & Maintenance – Let the landscaping crews from our full-service handyman company keep your trees, hedges, and perennial plantings trimmed and maintained for continuing beauty and health. Weed Control – Weeds are a fact of life for every yard and landscape. Weed removal and control requires specialized equipment, products and skills. Rely on us to handle all of your weed control jobs at prices that make sense. Call our Minneapolis St. Paul complete handyman company for all of your home’s or property’s outdoor chores. Our extensive network of lawn care, gardening, and landscaping professionals is at your command for every need, from one-time services to regular, ongoing landscape and lawn maintenance. As with all of our services, you can count on us for prompt, efficient, affordable work by highly trained, courteous professionals. HandyQuick is the answer for every service needed at your home.